Although Taro (Colocasia esculenta) is fast growing it does take the tuber up to 12 months to mature, so in a cold climate it really struggles to survive the winter. Originally from Malaysia through to India this is a plant that requires warmth and moisture, it is grown a lot more widely than this as it has been a popular crop for 1000s of years. 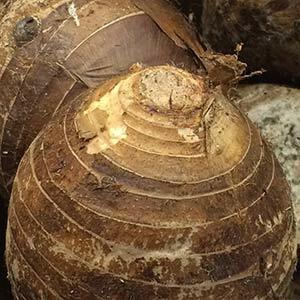 One of the fascinating things is that unless it is cooked Taro is poisonous, is also causes rashes on the skin, so even those gardeners who are growing this as an ornamental need to take care. One theory is that if you cut off the flowers the tubers will grow bigger and faster, very popular in Hawaii (poi), but also grown in Japan. Taro can be grown from suckers as well as from taro tops. The tops are simply a little of the top of plant with some leaves attached. The told are planted at around 25 cm deep. As the plant forms its first leaves the area needs to be kept moist. You can mulch around the plant to assist with this. The whole process of growing the tuber will take around 40 – 45 weeks. You need a moist, humus rich but well drained soil and a warm climate. Can you grow it in containers ? Yes but you would need to be enthusiastic. And yes, bun long is a so called dry land variety, however we know nothing about it.